[nextpage title=”Page 1″ ]There are a lot of fine holsters out there now, including kydex, leather, and hybrids that blend both leather and kydex materials. Leather has its advantages and kydex also has its advantages. All holsters have pros and cons. I have some excellent holsters made of leather and others made of kydex, but I wanted to consider one that was a hybrid combination of both leather and kydex in one holster with their respective advantages. I prefer to primarily carry Outside-the-Waistband (OWB), given my horizontally-challenged breadth, so that is the hybrid I looked for. I want to share with you my 10 criteria for selecting a holster to help you reduce the many possibilities, to help you evaluate holsters, and to give you some possible criteria for you to use to select yours. This article applies my 10 criteria to the BlackPoint Tactical Leather Wing Hybrid Holster, with a final recommendation for it. Leather Wing means there is a kydex shell that contains the handgun and two “wings” or side extensions made of leather. The idea is that the leather side wings will be flexible and conform to your body and hip shape, while the kydex material will be sturdy and allow a quick draw. Remember, however, what works for me may not work for you. So use your own criteria and decide for yourself according to your factors, preferences, uses, and priorities, etc. 1. QUALITY MADE: What is the material and is the holster constructed with quality? Is the leather of premium quality and genuine leather? What weights are the leather, kydex, and/or materials? Is the holster durable? Will it stand up to your everyday use, wear and tear, and is it appropriate for your use without impairing performance and mechanical function? What is the thickness and durability of materials? Are the rivets, clips, grommets, snaps, buckles, rings, and metal parts strong, rustproof, and quality made? Does it have a sweat shield or skin guard, if desired? Is it a reputable company with a positive history and reputation? What type of warranty or guarantee does it have? Consider the holster’s weight and bulk. Is the holster designed to minimize the amount of leather needed to hold and protect the gun, thus reducing weight and bulk of the holster. 2. ALL-DAY COMFORT: How comfortable is this holster model and style during each of the different physical positions: walking, bending, sitting, standing, and twisting? Can you wear it while driving in a vehicle? Can you wear it for the entire day comfortably and not even know that you are wearing it? Does it fit your body style well? 3. 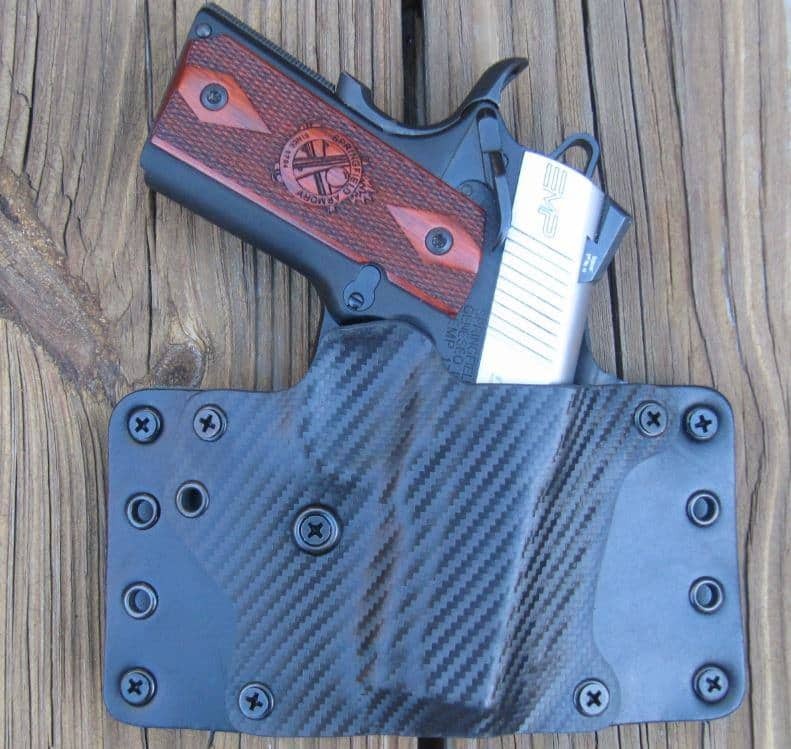 CONCEALMENT: Does the holster perform as required for the effective concealed carry purpose. How well does the holster hide the handgun during every-day body motion, like walking, bending, sitting, standing, twisting, reaching, etc.? Imagine wearing the holster during these different movements. 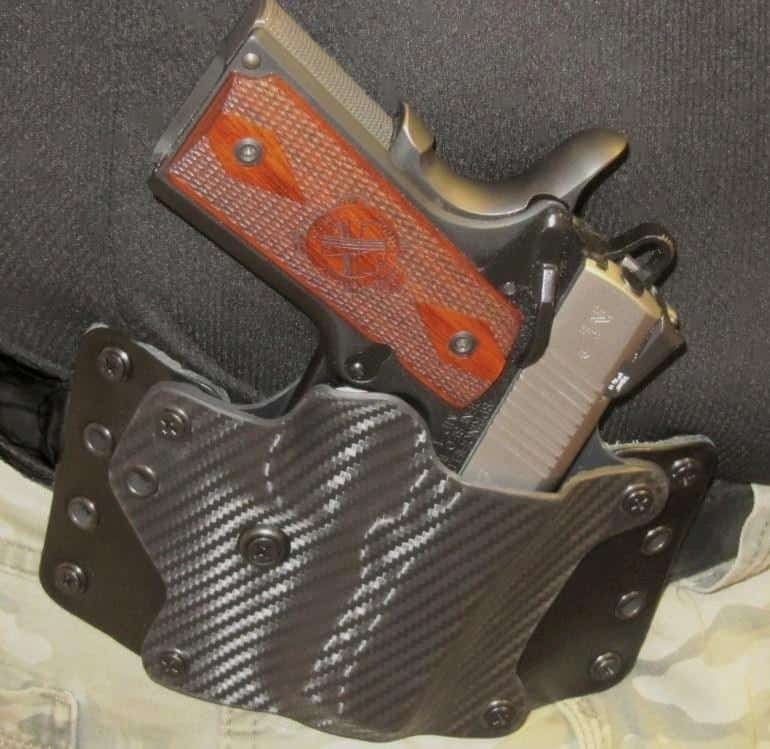 Is there a cant and angle adjustment for the holster, to provide better concealment and comfort? Is the trigger and guard well covered? Does the holster allow you to get a complete grip on the gun while allowing you to release any possible retention devices, if applicable? 4. ADAPTABILITY & FIT: Can this holster be used for different handguns… or with a laser sight or light? How versatile is it? Will it adapt to both men and women? Recognize that women naturally have wider hips than men which affect the fit, cant and rake of the holster and draw. The safety features of a holster definitely require that the holster be engineered and custom designed for each specific manufacture and model of handgun. Are there modifications available or additions that adapt to other handguns? What are the approximate costs of these adaptations? Is the shooter’s gun properly fitted for this holster? Does the handgun insert so deep in the holster that the gun grips cannot be properly accessed? Does the gun jam so tight into the holster that it takes two hands to draw it or can you draw easily with one hand? Are there matching accessories available, if desired? 5. PRICE: What is its total price relative to other options available now? Do you get any special features, options, warranties, guarantees, repair service, or additions that are worth something? Can you return it without any questions and within what time period? Will they repair or replace it for free? Do you get what you pay for? 7. EASE OF REHOLSTERING & ACCESS: Concealed carry holsters should allow rapid, one-handed drawing and unassisted reholstering. Can you reach your handgun quickly in an emergency or while sitting in your vehicle? The mouth of the holster should remain open and rigid when the gun is removed. A rigid holster will allow a handgun to be returned to it using only one hand, while a too flexible one may collapse after the gun is drawn, requiring the use of both hands to reholster. How easy is it to access and return your weapon and use the holster while walking, bending, sitting, standing, twisting, etc.? 8. EASE OF PUTTING ON & TAKING OFF: Can you simply and easily put the holster on and take it off. Consider if you will be putting this holster on and taking it off throughout the day and under what conditions. Must it be removed for taking care of personal needs in public restrooms? If so, can you do it safely and easily? 9. ACCOMMODATIONS: Can you wear both open or closed cover garments with the holster, as needed? Do you have to wear special clothing or make accommodations in dress or draw when wearing and using this holster? Is a special cover vest, garment, or larger trousers required to hide the holster and handgun? 10. RETENTION: Does the holster retain the handgun adequately? Is the holster snug and held tightly to the body when fitted on a gun belt for a consistent, fast draw, and to reduce draw resistance? Is the gun secure in the holster? A holster designed with solid retention will help prevent a gun from being removed from the holster by another. * Click the next button below to read my evaluation. To simplify, I will list my 10 Criteria and then beside each factor give my rating and brief comments. My final buy or not buy Recommendation will then be given at the end. Remember, these are just my opinions. I gave it a thorough test for several days with everyday routine wear. The leather was wide enough and flexible enough to allow very good conformance to my body style and was very comfortable. The high kydex shield on the rear of the holster made the holster comfortable when contacting my body and served as a sweat-proof shield. It was very satisfactory when bending over, walking, sitting, crawling under things, lifting, and exercising. At the end of the first day, I really forgot I was wearing the holster. 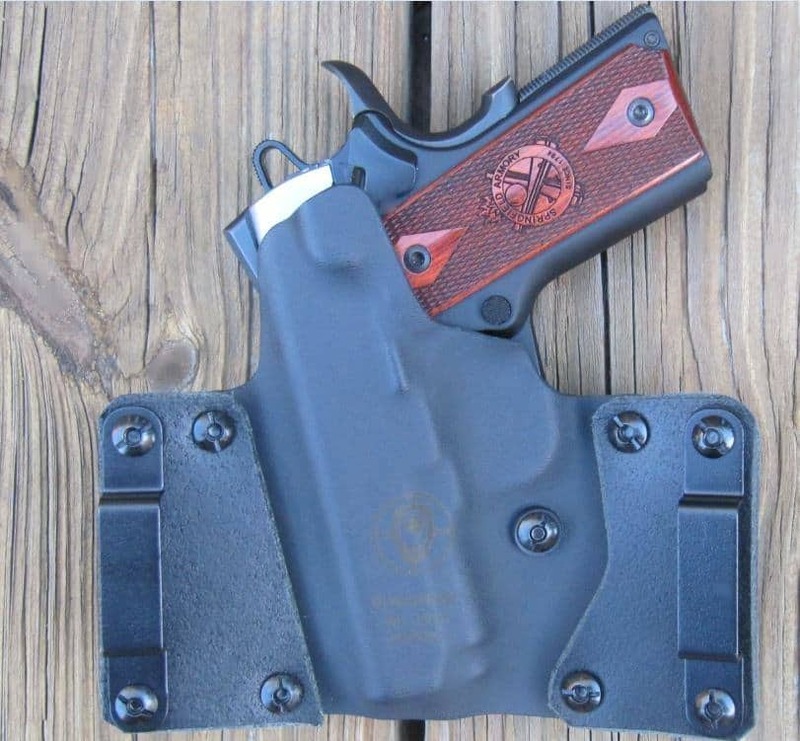 This OWB holster satisfactorily hide my Springfield EMP when I wore it during every-day activities and movements. The flexibility of the leather wings made a significant difference in comfort and concealment. Often, I wore just a t-shirt with shorts and my gun was concealed. However, for this chunky guy and my EMP’s 3″ barrel, with a thinline grip width of 1.11″, a 1.98″ grip length, a 5″ height, and a weight of 26 ounces for this single-stack 1911, I wanted just slight more concealment. I recognize that a pistol in a poor-fitting holster will wobble, sag, and shift around a lot. It did not do this. I’m not sure if it was because of the cant of the holster, my extra girth around my stomach, or the leather-hybrid material combination, but my gun stuck out more than I wanted from my body and did not fit perfectly close to it, but not enough to detract from my rating. Now don’t think it was not acceptable, because it certainly was, but just not 100%. Recognize that I am working on loosing some weight around my middle, which may help the fit to my body style. The holster does have adjustment holes to modify concealment and comfort. The holster molded nicely to the curve of my body after about 2 days. The holster fit my gun perfectly. The hybrid combination of leather and kydex is a good model for adaptability and the Leather Wing exactly fit my EMP. It was snug in the holster, rode high on my body, and covered the trigger guard, as you can see in the above picture. They “maintain one of the most extensive inventories of in-stock weapons to use for molding purposes.” But if your gun is not listed, contact them for customization. The holes on the wings allow for adjustment of holster height and with optional clips, the holster can be converted for IWB carry. The kydex is riveted with several brass eyelets. The holster includes a passive retention system that is adjustable by a screw that you can tighten or loosen to adjust the force required to draw the handgun. You have the option of a 10-degree cant or no cant. The back of the holster has steel belt loops and are available in three sizes, 1.5″, 1.75″,and 2.” The holster I received came with 1.5″ loops. You can specify your desired loop size and buy additional loop sizes for $10. Also various accessories, apparel, and magazine pouches can be ordered, like a double pouch for $50 and molle clips. About 25 different colors are available and several models are available to accommodate various rail-mounted lights. You can even get hot pink and killer coyote colors. * Click the next button below to read the rest of my evaluation. The price of about $90 for the Leather Wing seems slightly higher than some similar hybrid holsters, but I do recognize the high quality and features of this holster. You almost always get what you pay for. 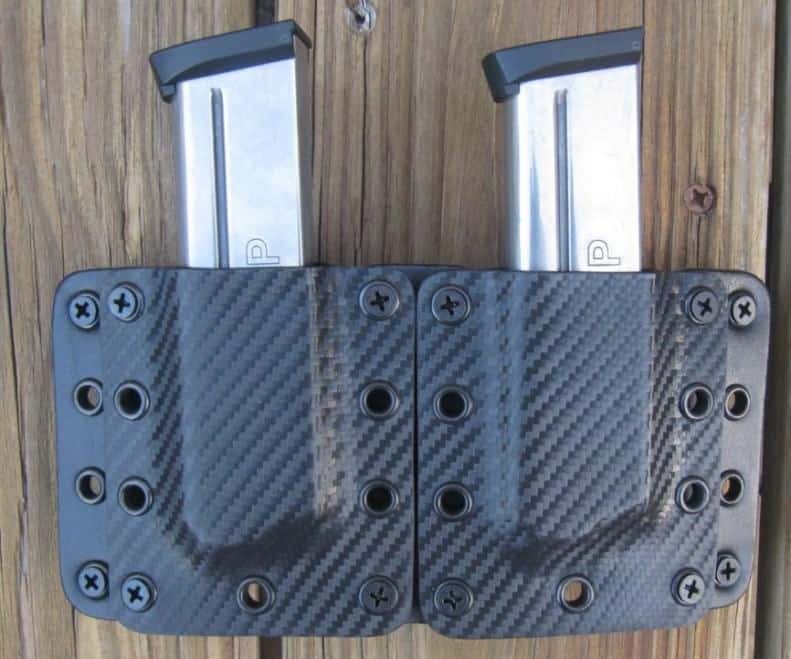 Other similar hybrid OWB holsters I found ranged from $50 to about $100, including such brands as Crossbreed, Alien Gear, Comp-Tac, Blade-Tech, Vedder, Pro-Carry, Bullseye, Fist, Etsy, etc. There are variations in leathers and thicknesses, as well as available options, delivery times, features, warranties, and quality. So check out these options before you buy. This holster and pouch had excellent craftsmanship and quality. Current lead time (time from placement of order until it ships) is about 3 to 3.5 weeks, according to their website. Tyler Johnson, Co-Founder of BlackPoint Tactical, is offering a 10% discount for purchase of their products for 60 days after this article’s publication date. To take advantage of this discount, enter or provide the discount code “ColBen2015” when ordering their products. This holster provided more than adequate safety protection for the handgun and nearby people when presenting/drawing and removing the gun into and out of the holster. Your carry gun must be protected and free from negligent discharge or movement of the hammer especially when drawn and re-holstered. Your personal safety is greatly affected by what you pack, how you pack it, and where you carry it. This holster was designed appropriately to permit sufficient hand grasp of the gun when it was holstered so the hand grip would not have to be modified. I was able to keep my trigger finger straight along the outside of the holster easily and to grip the gun quickly and correctly to prevent negligent discharges, accidental trigger movement, and without accidental disengagement of the manual safety or hammer movement. It was easy to reach and draw my handgun quickly and to re-holster it without looking or using two-hands with this holster. There should not be a presentation or draw problem in an emergency. The mouth and holster is sufficiently rigid to allow a handgun to be returned to it using only one hand. This holster was very easy to attach to the belt and there were no problems putting it on or taking it off. It seemed to naturally conform to my hips after just a few times of putting it on. You can wear both open and closed cover garments with this holster and not have a concealment or operational problem? There is no design problem that would prevent using any type of coat, shirt, sweater, zippered jacket, or any garment with this holster. You can order the holster with or without a cant, which is about 10 degrees. No special clothing or extra accommodations in dress or draw are needed when using this holster? The holster design did retain my handgun adequately at a basic retention level? The holster was snug and helped to reduce draw resistance because of its construction and my sturdy gun belt. You do not have to overcome the pressure of springs to push down or rotate a hood, unlock a mechanism, flip a lever release, press a button, tab or perform separate motions. Total Points: 94 points out of 100 possible = 94% = Recommended. I hope my process, this analysis, review, and my opinions help you to identify your criteria and evaluate your individual factors to help you make YOUR personal decision for your holster purpose, needs and priorities. Photos by author with some from BlackPoint Tactical. Previous articleWhat Do Different Types Of Ammo Do?